Stanbridge College has been named to the 2009 President’s Higher Education Community Service Honor Roll, the highest federal recognition a college or university can receive for its commitment to volunteering, service-learning and civic engagement. 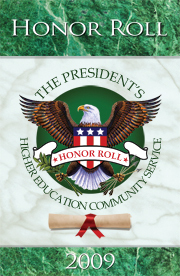 “Stanbridge College students, faculty and staff are delighted to be named to the President’s Honor Roll. Our commitment to community service is deep and on-going. Our students have consistently involved themselves in projects to serve those in need, and we recognize their efforts in accepting this honor,” said Yasith Weerasuriya, Chief Executive Officer of the College. College students make a significant contribution to the volunteer sector; in 2009, 3.16 million students performed more than 300 million hours of service, according to the Volunteering in America study released by the Corporation. Each year the Corporation invests more than $150 million in fostering a culture of service on college campuses through grants awarded by its programs, the education awards that AmeriCorps members receive at the conclusion of their term of service to pay for college, and through support of training, research, recognition, and other initiatives to spur college service. The Corporation for National and Community Service is a federal agency that engages more than five million Americans in service through its Senior Corps, AmeriCorps, and Learn and Serve America programs, and leads President Obama’s national call to service initiative, United We Serve.